Spare parts for oil and gas producing complex. About the company. The enterprise UralTehnoImpeks is one of the leading innovative companies in the South Ural. During eight years of performance since 2004 due to the restructure of labour and production resources the company has turned into the largest production association. The production facilities with a great variety of state-of-the-art equipment accompanied with innovation and individual approach in solving technological issues, as well as flexible pricing and high speed of executing orders let the enterprise enter the market of components for hydraulic fracturing of a layer pumps and coil tubing equipment. Our products have gained a good reputation and they are in great demand among the largest oil-servicing companies operating in Russia. We have mastered the production of spare parts for such pumps as QWS -2500, TWS -2000, TWS-600S, TWS-400, TWS-250, Kremko 6К500, НТ-400 (valves, seats, inserts, plungers, hydrauhousings, etc. ), and for Bleder МС 60 and МС 100 (pump casing, impeller, stuffing-box casing) so far. 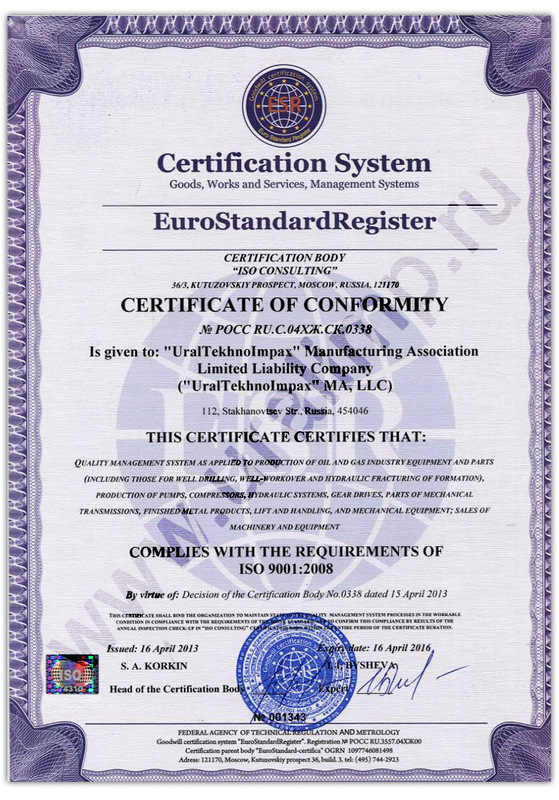 Today OOO PO UralTehnoImpeks is a valid member of the South-Ural Chamber of Commerce and Industry and implements advanced scientific achievements and technologies of manufacturing spare parts. 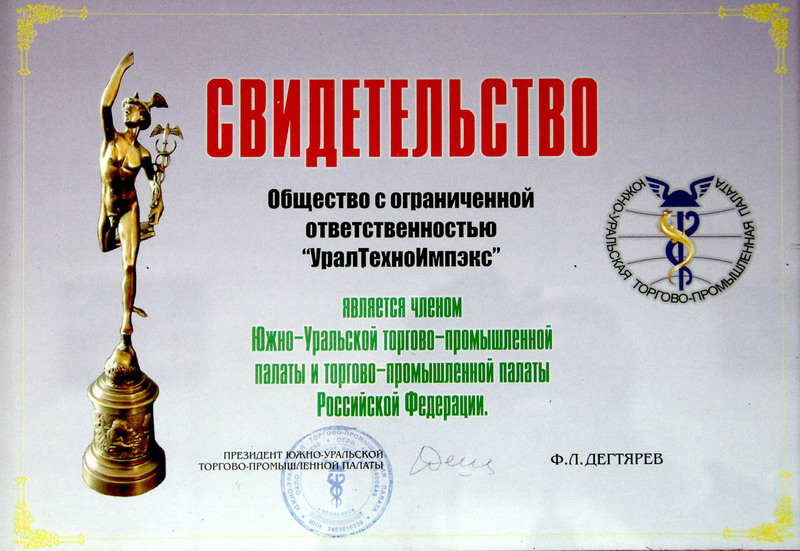 It resulted in getting patents from the Russian Patent and Trademark Office for “Valve 5M” with the adhered insert (№101506), a valve unit of a plunger pump (№106928), a plunger pump (№114346) and for producing string and drill pipe connection (№102665). The valve unit of a plunger pump has passed the mandatory certification to conform the requirements of technical regulations “On machine and equipment safety” ratified by the RF government regulations dated September 15, 2009, № 753. 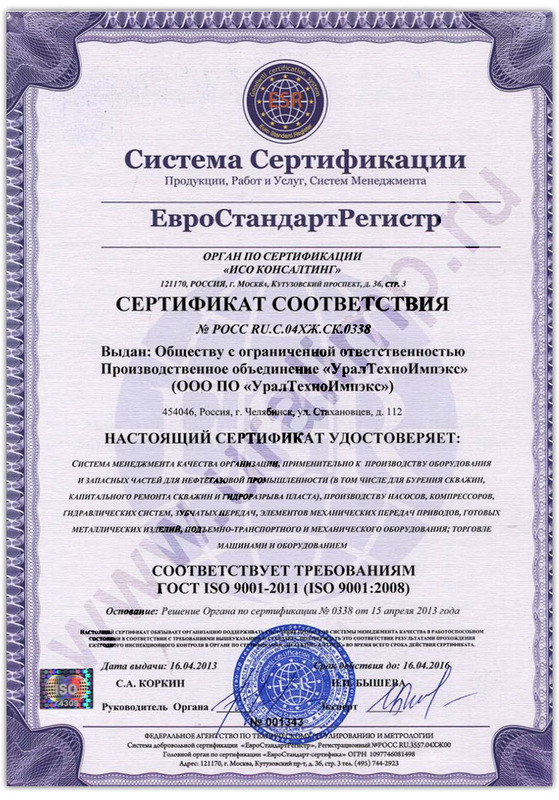 The quality management system of producing oil and gas industry machines and spare parts (including components for complete overhauls of oil wells and hydraulic fracturing of a layer) complies ISO 9001:2008 (ГОСТ Р ИСО 9001-2008) requirements and certificate of conformity № РОСС PU.С.04ХЖ.СК.0127. The result of UralTehnoImpeks fruitful performance in the sphere of manufacturing and supplying oil and gas industry equipment under the management of its CEO, Sergey Yangareev, is awarding him the highest order of the public recognition Honorary Freeman of the RF.